Thank you for the kind words! I spent many hours enjoying System's Twilight (as well as Cliff Johnson's games) years ago as a kid, and like you said, I felt the world needed more games in that genre. Zarf - thanks for posting this. I couldn't figure out how to contact the author, but maybe he will see this. I finished the game (and it's not easy!) 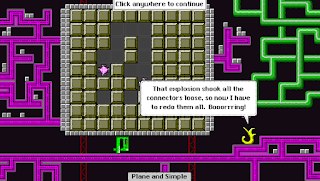 I thought the interface was tightly put together, and the puzzles showed a lot of variety and ingenuity. I hope it finds a lot of players.